This view of Titan was taken by the Cassini spacecraft on Jan. 2, 2009. SAN FRANCISCO ? Complex molecules similar to the buildingblocks of life on Earth may be able to form on Saturn's moon Titan, a new studysuggests. Organic molecules falling out of Titan's atmosphere couldreact with liquid water on the surface of the moon to form biomolecules likeamino acids, according to the study. This liquid water could be delivered bycomet strikes or ice-volcanoeruptions, and it may stay liquid long enough on the frigid moon for suchreactions to take place. "It's very possible that you could get biomolecules,"said study author Catherine Neish of Johns Hopkins University's Applied PhysicsLaboratory. Neish presented her results here today (Dec. 14) at the 2010 fallmeeting of the American Geophysical Union. Lotsof organic molecules swirl about in Titan's nitrogen-rich atmosphere. Thatatmosphere doesn't contain much oxygen, though, so the chances of formingbiomolecules like amino acids in the air aren't great, Neish said. But those organics fall to Titan's ground all the time. "They just continually trickle down out of theair," Neish told SPACE.com. On the ground, organics might have a chance of mixing withliquid water, which could supply the required oxygen. Wateris not a common feature on Titan, which has liquid-hydrocarbon lakes. Butit could be delivered by events such as comet strikes or ice-volcano eruptions,Neish said. 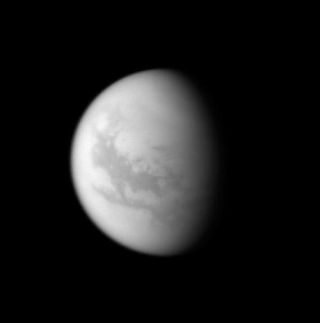 Titan's surface is a frosty minus 290 degrees Fahrenheit(minus 179 degrees Celsius), so any such water would eventually freeze. Butprevious work by other researchers suggests that water supplied by suchdramatic events might last surprisingly long ? from 100 to 1,000 years ?because there'd be a lot of it. Neish was interested in knowing whether complex biomoleculesmight be able to form in this timeframe. So in the lab, she mixed Titan-likeorganic molecules with liquid water at low temperatures ? 32 degrees F (0degrees C) for pure water, and minus 4 F (minus 20 C) for an ammonia-water mix. In both cases, oxygen-containing molecules were producedvery quickly, on the order of several days. Further experiments found that thereactions produced at least four identifiable amino acids: asparagine, asparticacid, glutamine and glutamic acid. These hints of complex chemistry are intriguing, but theydon't suggest that the Titansurface is crawling with life, Neish said. "I'm fairly pessimistic about the prospects of life onTitan," she said. "To sustain life, you need some sort of energysource. And there's just not a lot of energy there." But she thinks the new study has the potential to yieldinsights about how life could have arisen on Earth, which may have resembledTitan in many ways long, long ago. The study suggests, for example, that biomolecules arefairly easy to make, even at low temperatures. So it's not too much of astretch to think that life may have taken root in coldenvironments on Earth. An icy surface could protect any nascentbiomolecules from damaging ultraviolet radiation, for example, and possiblyfrom impact events, Neish said. "Darwin talked about life possibly forming in a warmpond," she said. "Well, maybe a freezing pond is a good place forlife to begin."